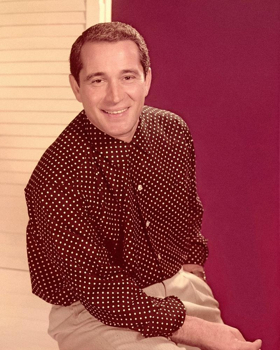 For over 50 years, Perry Como ranked as one of America's most successful and beloved entertainers. A big band singer in the late 1930s, a radio star in the 1940s and then a TV headliner in the 1950s and beyond, Perry was a warm and welcome presence in tens of millions of households for six decades, charting over 100 hit songs along the way. Now, for the first time, a collection of Como's biggest hits from long-lost and newly-restored episodes from his TV series and specials (1948 - 1988) - including rare color programs and more recently discovered footage - is being presented in Perry Como Classics: Till the End of Time which offers a fond look at a talent beloved both on and off the stage and screen. Perry Como Classics: Till the End of Time premieres around the country the weekend of Saturday, June 2nd. Perry Como Classics: Till the End of Time is hosted by Peter Marshall and Nick Clooney and airs as part of the long-running My Music series of PBS fund-raising specials. Hit records such as "It's Impossible," "Catch A Falling Star," "Some Enchanted Evening," "Magic Moments," "Round & Round," "Home For The Holidays," "And I Love You So," "No Other Love," "Hot Diggity" and dozens more made Perry Como the second most popular male singer of the 20th century on the record charts, ahead of Tony Bennett and Frank Sinatra and just behind Bing Crosby. Como was a television staple for over 40 years, beginning with his hosting duties in the late 1940s on "The Chesterfield Supper Club" through the early 1990s in series and specials that set the standard for variety programming, winning numerous Emmy Awards and other accolades while drawing devoted viewers around the globe. Perry Como Classics: Till the End of Time features the singer singing duets with Dean Martin,The McGuire Sisters, Lena Horne, Carol Burnett, Bing Crosby and The Lennon Sisters plus there are warm remembrances from celebrities like Carol Burnett, Regis Philbin, Jay Leno, Kathy Lennon (of The Lennon Sisters), Leonard Maltin, Richard Carpenter, Debby Boone and Steve Tyrell.